Seville is the capital of Andalusia. Flamenco dancing originated from here. Seville is thought of as the most Spanish city in Spain. It is full of beautiful buildings and gardens and the population (800,000) is thought of as very spiritual, sensual and romantic people. Christopher Columbus is buried here. When visiting Seville as a tourist, one of the best ways to see the city is on one of the hop-on hop-off tour buses that are operating in the city. They generally all follow the same route around the city. 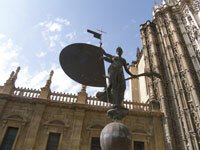 You must make sure that you visit the Seville Cathedral - the largest Gothic church in the world. (Try to avoid arriving between 12:30 and 2:30 as there are normally services during this time and you will not be permitted entry. Opposite the Cathedral is the Alcazar which you really must visit. Do not be put off by the queue as it moves very quickly. The Alcazar is an amazing architectural feat as it combines spectacular buildings from a once Moorish fortress, with Gothic and the Admirals quarters from the renaissance style. The Renaissance quarters is now house for amazing oil paintings which you many view at your leisure. The hall of the ambassadors equals anything seen in the Alhambra Palace. Leading on there are large impressive gardens with numerous water features tough out. There are also many Flemish tapestries depicting Charles V's Tunis expedition of 1535 including an upside down map of the Mediterranean. Back near the tourist bus main hop-on site is the Torre Del Oro (Tower of Gold) this stands next to the river. Gold colored tiles once covered the walls of this 13th century chess-piece castle which is all that remains of Seville's medieval fortifications. Pedro the Cruel used the tower as a prison but it is now maritime museum. Upstream lies the Cartuja - the site of the 1982 World exhibition. Many pavilions still remain today. During the exhibition the various countries would show off the best of their country. Countries would show off everything from buildings to herding their best livestock through the streets of Seville. The futuristic bridge gives access to the Discovery Park where the landscaped gardens compose the setting for the pavilions that formed the centre piece of Expo 92. The exhibits record the achievements of the great navigators and explorers of the time. You can still see items such as a replica of the Arian space rocket. Seville has much to offer the tourist. It is certainly a perfect place not to rush.